Entities that came to talk: Tar From Orion. Interlocutor: Is here present some entity that will initiate the session? Tar: My name is Tar, and I am joyful of being able to communicate with you, since the messages that I am going to transmit can be useful for future life.Throughout different eons I have seen bloom different civilizations, not only in this world, but in other worlds of this vast universe. Also I have been present at the fall of many empires, learning that the earth power is ephemeral. Only the Light of the Cosmic Essence is eternal. I know that many are eager to know what is going to happen in your planet. No spirit has the gift of divination and we can only predict a certain event, using common sense. In this world great changes, not as much geologic, but changes of consciousness are approaching. practically know the beginning of this planet, when everything was a single continent. Interlocutor: Where is your origin? Tar: I come from Orion. My spirit was created thousands of million years ago. I was witness of the end of many planetary systems and also of the creation of others more recent. 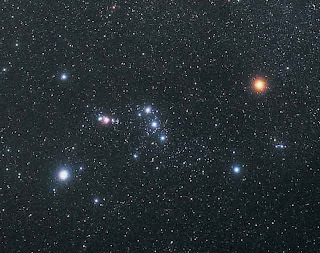 I was in the formation of the Solar System, also in the formation of the Pleiades. These stars are of third generation, whereas your sun is a star of second generation. Your planet had in its beginnings a lethal atmosphere for present life. There were great changes. At the end life was developed, although they only were unicellular animals. As time went by, life began to be more complex. After the extinction of the dinosaurs, there was a humanoid race that inhabited this world. They were gigantic beings that came from another stellar system. There was much erroneous information on that matter. Even in your Bible those beings are mentioned and also in other old writings. It was thought that those gigantic beings were children of spiritual and terrestrial entities, which is not correct. The truth is that immense interstellar cruises came and were visiting the Earth. Since it was a very hostile climate, the expeditionary could not be used as habitat. However, one of the ships remained, creating an artificial climate in a region, where those beings could stay. But they did not survive the volcanic eruptions and the earthquakes, which were many more than at present time. Later discoveries of bony rest revealed that there were beings which measured approximately between 3 and 4 meters high. Interlocutor: Perhaps, you are talking about the time of Lemuria (the lost continent)? Tar: Much more back in time… Soon new forms of life were developed, until a new race was formed, but directly terrestrial. They were very basic beings, with primary instincts. Interlocutor: Are we speaking about the two first human races? Tar: Long before the first one known and after those giants. They had lived 500,000 years ago. The air was still not breathable for your present physiology.It was a 98% of carbon dioxide. Oxygen almost did not exist. The average temperature was in the 40º Celsius (104º F), according to present measurements. Soon that Era started changing. The species were perfected. It has been verified that other ships came in other times to experiment. Tar: The reactive mind has been since the beginning of the spiritual evolution. Interlocutor: I didn’t have that data. Tar: Spirits were created with a reactive mind, channeler of ego, because we only evolve from the imperfection. Interlocutor: I know that many spirits have managed to overcome their ego and already are in the planes of Light. Tar: That’s right, although spirits who are dominated by ego are much more numerous that those which surpassed their ego. There are 4 spiritual planes or levels, from 2 to 5, plus level 1, the physical plane. They are 5 planes altogether, with different vibratory levels. The most known are those that they communicate periodically with the incarnated beings of the physical plane. These are the spirits of Error, who dwell in planes 2 and 3.The fourth and fifth planes are levels of Mastery. The beings that inhabit those planes are very much evolved into the pathway of Light. Interlocutor: In an occasion, we communicated with Master Jesus. In what vibratory level is he? Tar: Master Jesus is in the 5th plane. Interlocutor: I have understood that he only projects a particle of his being. Does he? Tar: Nearly less than a particle. There are very few earthly entities that can communicate with a master of Solar Hierarchy. I say of Solar Hierarchy and non Planetary because Master Jesus has ascended in the last two thousand years.As well as Jesus ascended from Planetary hierarchy to Solar hierarchy, the previous Solar Logo, the Christ, ascended to Dimensional Logo category. At this moment the Christ is in the maximum spiritual hierarchy. But he is not the only one. There are other Divine Energies that act, as the Buddha, who is the present Galactic Logo. Interlocutor: Could we know which your function is? Tar: My function is being a messenger throughout time. Speaking in human terms, it would be what you call a mail… I was incarnated centuries back in your world to bring wisdom. I lived millenniums ago in the Egyptian civilization under the name of Thot. Previously, I was in which you call the Age of Stone, coexisting with beings in wild state, similar to your primates.Many civilizations have disappeared in this planet. Interlocutor: You said before that beings from other planetary systems have also come to Earth to experiment. Is that so? Tar: Correct. This planet was used as a test field. Tar: For example, your contemporary Darwin spoke about the evolution of the species; it was undergone five thousand years back by extraterrestrial beings. Many of these foreign races have left different developing species in dangerous places of your world, and returned to look for them after one thousand years of your calendar. Those entities had mutated, they had experienced biological changes for the better, to protect themselves from the climate or the aggressions of other natural species of the planet. These entities had got in one terrestrial millennium what in a normal passage it would take ten or twenty thousand years. Those expeditionaries proved that the process could be accelerated demonstrating then that this is possible. Interlocutor: How has the Homo sapiens evolved? Tar: The Homo sapiens has evolved too slow, but by his own engrams. There is a planetary engram that at this moment is delaying it. The human being tends to lose his teeth and to enlarge his skull and encephalic mass. If this race is not extinguished, the day will come when he is not going to need to feed, since he is going to nourish from his star, the Sun. He is practically going to get energy through the dermis, by the epidermis. Tar: Not like photosynthesis. He is going to feed himself from the energy of his central star, also from etheric vibration. The human being will be so evolved in the future that he’s practically going to be free of diseases, it happens in some advanced planetary systems. That is if before he does not destroy his habitat. Scientific advance is so large with global cooperation, that is so sad to see how in the planet Earth too many discoveries are delayed or others are not getting known by stingy economic interests. There are some travelers of galactic cruises that directly manage to mute their physical vibration to change it when they have a health problem. As far as their technology, they have advanced so much that they put on their ships a power field that makes them invisible to any detector. Other travelers use “wormholes”, that are like tunnels in the emptiness, which they connect thousands of light years of distance. For that reason they can cross great distances in seconds, leaving the physical universe from one sector of the galaxy and entering another in a short time. They have 7 civilizations in your planetary system. There is a civilization that arrived from a distant star and it was based in Ganymede (the largest moon of Jupiter). They are very advanced beings, but before they were not. Interlocutor: They live inside Ganymede? Tar: Yes, inside the satellite. Their technology allowed them to get a habitat where they can isolate themselves from the atmospheric frosts conditions of the surface. At the present time, they have directly taken to Ganymede inhabitants of your planet to approach them into the spiritual pathway. Their philosophy is based on material detachment, but it was not always so. In passed times, they had great fights. They had a great technology but they lacked of love consciousness. Their spiritual advance was done in these two last centuries. In previous centuries the beings from Ganymede were devoid of an altruistic vocation. Interlocutor: Were their fights only internal? Tar: There were great fights with inhabitants from a planet of the Syrian Galaxy. This one was a community of entities that lived exclusively for Service and towards the pathway of Light. These beings wanted to convince the inhabitants of Ganymede to demote their militant attitude, but they full of pride did not accept it. On the contrary, they watched at neighboring worlds with greed. The only way those beings from Syrian had to restrain that situation was to impose a change in attitude of the others. In fact, a superior being cannot overrun by force another one because good sets out. But, really, one is always avoiding a greater evil. Since Ganymede was about to put under the planetary system of Syrian, which was not so advanced technologically, as they believed, they had to be overrun by force. Those evolved beings from Syrian got with different apparatuses to change the mind of the inhabitants of Ganymede. They had to do it, because they did not have another alternative. Interlocutor: For doing that… Do they need some special permission? Tar: No, because God gives Free Will and Spiritual Entities do not get involved int the struggles of the physical plane. Then, these beings from Sirius came to this stellar system and modified the mind of the belligerent inhabitants of Ganymede . It’s not that they wiped out their minds, but they changed their militant part. With time, descendants of that militant race from Ganymede evolved in knowledge, philosophy and Love, using scientific knowledge for the good. Aeons back there were also Mars beings and at that time they were not prepared either for a warlike fight. The Mars beings had dedicated to agriculture. They were pacific beings and they lived in harmony altogether. But they had a tremendous epidemic. There was one plague, very great, it was a disease like in Earth you call chicken pox that has decimated people by thousands. They were forced to take refuge inside the planet. In Venus something similar happened. Many millennia back there had been a flourishing life in that planet. The atmospheric climate was very different, as much in pressure as in temperature. There was no comparison with this present time, where temperature and atmospheric pressure are so elevated making life impossible. Like the stellar travelers who were based in Ganymede, the inhabitants of Venus were also very arrogant; they thought that could dominate the entire solar system. They have also been decimated. Venus has changed much since then. There were great wars, great later cataclysms that have changed their atmosphere. Interlocutor: Could you confirm that at this time Venus atmosphere for the terrestrial man is not accessible? Tar: No, it’s not accessible for you. You could not support its atmospheric pressure, 90 times the one of your world, neither its temperature. Interlocutor: In this planet (Earth), are we going to continue advancing spiritually or it’s going to back down? Tar: These advances are going to follow, but this planetary engram, reinforced by engrams of countries, relatives and individual, had caused that it is very difficult to overcome it at this time. Consequently, this race is approximately five thousand years back in their spiritual pathway. There had been very few changes, with the exception of some people who have become aware of how their world is being deteriorated and try to change the way of thinking of others. Interlocutor: Here changes are taking place thanks to Dianetics and Scientology, sciences whose founder was Ronald Hubbard. At least, Scientologists are freein people from engrams, and that is important. Tar: Yes, but in a very slow proportion. Often we have communicated with different entities that use Dianetics and they are powerless, because for each one that they can take to the Light, there are ten which directly enter the shade cone, folded by their emotional field. Many people harm, many people hurt, many people implant engrams to other people by the singleact to put under. This civilization is so much behind spiritually that they think if put people under, they can rise more fluidly. Therefore, doing engrams to close ones, putting them under to rise, without realizing that they are not progressing, but backing down also they make back down all their family, all their work surroundings and their friendships surrounding. So, they start falling one after another like pieces of a terrestrial didactic game. It is very difficult to reach the pathway we expected. But anyway, it must be acknowledged that Dianetics is one of the valid ways to release engrams from this planet. Interlocutor: There is also another therapy called Psycho-integration, created by Professor Jorge Olguin, which helps to overcome the ego. Tar: Soon there will be contacts with assistant beings. There will be entities that will approach every human being and they are going to subconsciously dictate how to overcome certain engrams, but because time is closer, we already need to begin raising this race. Interlocutor: How do you see the mission of our spiritual group? How can we be helpful? - Keep your mind elevated. This is even more important because in keeping your mind elevated, any negative vibrations will not hurt you. On the contrary, you will be more willing to help others who might need it. - Do not attack the surroundings. It is important to be always calm, because when we lose control, we can reflect in the other that loss of control. Bear in mind that at any level, from the material plane to the spiritual one, both are a mirror. If a spirit loses control, the other spirit reflects like a mirror that lack of control and between the two there will be a power struggle. Aggression brings more aggression. It is wrong to think, in human terms, that all spiritual beings are Masters. There is a lot of misunderstanding on this. There are religious centers on the planet Earth that constantly communicate with spiritual beings, as some schools, as some yoga meditation centers, or directly spiritualist centers. But they only communicate with the second level. They don’t communicate with the highest levels, except when some great Master or a great Guide comes. Interlocutor: Now, I would like to ask you if this vessel, which you are using at this moment, is transmitting your thoughts well. I ask you because this is the first session that we are going to record. Tar: This vessel gets me without any interference. As time goes by, with practice, he will channel more. With regard to the validity of my messages, all that I bring are messages of guidance, information and service. Interlocutor: Is it our job to disseminate these messages? Tar: The mission of any spiritual group is to spread words of Light for the benefit of their fellow human beings. That is not an imposed task, but a task that is performed with joy. In the same way, you should not impose any idea, but transferring knowledge to those who require it. At this time, I have at my side another entity, from another system that wants to communicate with you. Interlocutor: Thank you Tar for your presence here and your messages. Tar: There is still much you should know, especially about how the Earth was unfolding. I humbly tell you that I am who has more knowledge of the subject, not only for having studied your habits, but for having embodied twice on this soil. Tar: Yes, I understand that all the spiritual words point to the Light. But also, in my case, I seek to convey new revelations that clear many mysteries of your past. I leave you with another brother of Light. The present universe was created about 14 billion years ago and our sun has “only” 5 billion years. It was formed with the gaseous rest of stars of first generation, already extinguished. Reactive mind is that function of the mind that keeps and retains physical pain and painful emotion and looks for to direct under the stimulus-answer principle. It thinks only about identities. Analytical mind, however, is the function of the mind that it perceives and retains information to raise and to solve problems. It thinks about differences and similarities. Reactive mind is a survival mechanism that enters to work when the analytical mind becomes disconnected. It’s the one that handles impulses. Finally, as reactive mind is instinctive tries “to prevent that a person gets in danger”. Engram can be defined as a mental image of a past experience that contains pain which is a real or imaginary threat against survival. Engram is an unconscious registry of the reactive mind. A Light being, named Juan Damasceno said, "Silence is the appropriate expression of man's relationship with God, because of the Divine significance. Silence, therefore, should not be an excuse for failing to do theology, but rather a path to bring us close to knowledge.